Before I get to the contents of the game you see in the photos below, I probably should note that this is the Asian release of the game known in Japan as Minna no Sukkiri and in North America as Hot Shots Shorties. So, why'd I pick up the Asian version as opposed to the Japanese or North American ones? First, I wanted a boxed/physical copy of the game--which isn't a possibility when it comes to the North American release. Second, the Asian version includes English text--something that isn't the case with the Japanese original. As for the point of Everybody's Stress Buster: it's mini-game-focused spin-off of Clap Hanz' excellent Everybody's Golf (aka Hot Shots Golf or Minna no Golf) series. In fact, 12 disparate mini-games are stuffed into Everybody's Stress Buster. As is often the case with such things, some of these morsels are more appetizing than others. My favorites thus far: the Dynasty Warriors-esque "Counter Crusader" and the Katamari Damacy-ish (kind of) "Vacuum Dash." I've also got a bit of a soft spot for the rather boringly titled "Bookshelf Dash." As is true for far too many of the games included in this series, I haven't yet put a ton of time into Everybody's Stress Buster. I'm going to do my best to give it the attention it deserves early next year, though--especially since I could use a smidge of serenity at the moment. Wow I totally never heard of this, which is surprising since it came to the US. Hot Shots Shorties sounds like a hip hop Hot Shots Golf game, but I assume the "shorties" just refers to the minigames. Is it really intended to be a stress reliever, like the way those Brain Training games are supposed to make you smarter? Don't feel too bad, Steve--this game's North American release was pretty stealthy. Also, yes, the 'shorties' part of the NA title refers to the mini-games. As for it being like Brain Training: No, not really. I'm sure the games can relieve stress, but mostly I'd think of them as just providing short bursts of fun, kind of like your average iOS game. You think Pangya is better, Espiga? I've never heard that before? Regardless, that must mean Pangya is great, because I really like what I've played of the Hot Shots series. Have you played the Mario Golf games, BTW? If so, what do you think of them? Pangya is similar to Hot Shots Golf, but it's got more memorable characters and a cuter, more anime-inspired design. 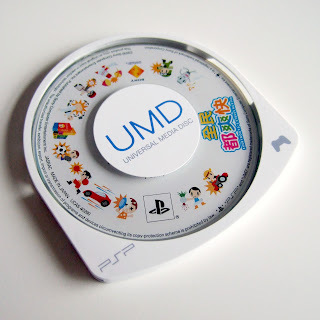 It started life as an online PC game (as most Korean games do) but eventually came to the PSP and Wii. The PSP version is called Pangya: Fantasy Golf and it came to the States. I'd imagine you can find it for pretty cheap. I just checked Amazon and you can get it for $6.99, so I guess so! Furthermore, Zig reviewed it on UZW some time ago, so if you want to read his opinion on it, it's there for your perusal! Thanks for the info, Espiga! I'll definitely check out Zig's review of Pangya shortly. As for not liking Mario: there's no shame in that, if you ask me. I've quite liked many of the games he's appeared in over the years, but I can't say I have a massive affinity for the character himself, and I certainly don't buy every game with Mario in it. Awww the disc looks soo cute! And the box-art too! 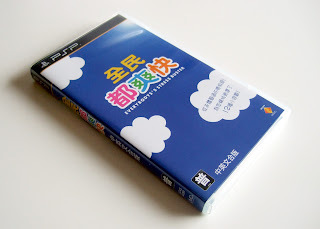 I like beautiful simple boxarts :) I guess I would take the asian version too. Under this circumstances. Yeah, I especially like the art on the UMD, Lizzi :) The box art is nice, too, though, I think.